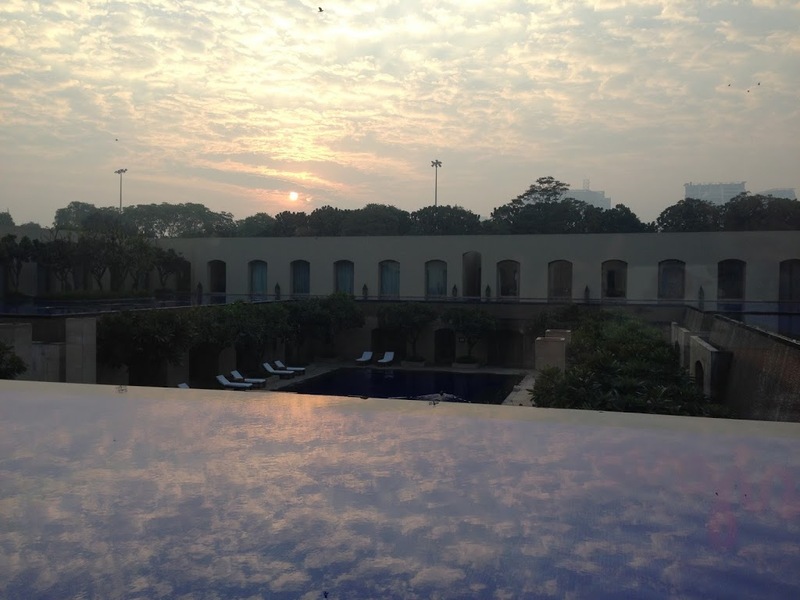 Let me say first, we chose to stay at the Oberoi and Trident hotel brands in India as I have family connections to the brand, so we went through them. We also got upgraded at all our hotel stays in India, so many of the images you’ll see of our rooms and views, were because of our upgrades. I can’t say anything bad about either brand, Oberoi or Trident, as we had impeccable service, incredible experiences and nothing bad to say at all. The hotels were gorgeous and each totally unique. With that, I’m adding another hotel review to the Hotel Review Guide collection today which you can find on my travel guides page. The hotel pool and grounds. The Trident brand in India is the lower cost, business version of the Oberoi brand (in a way, as they are equally gorgeous and unique to the larger and more elaborate Oberoi hotels). 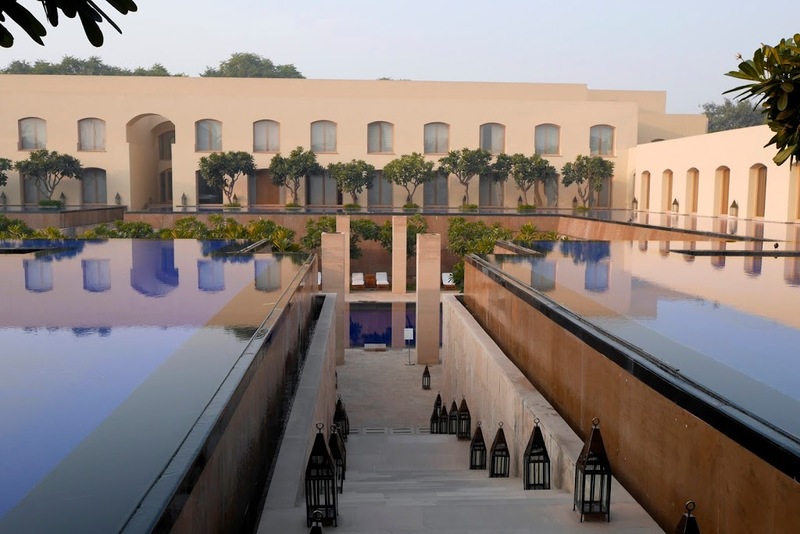 We decided to stay at the Trident in Gurgaon (a close suburb of New Delhi) at the suggestion of my family connections in India. I couldn’t have been happier taking this advice as this hotel is gorgeous, incredibly easy to get to from the airport and simply stunning, night and day. We arrived around 10pm at night and were upgraded on arrival to a gorgeous suite overlooking the pool. We woke up early the next morning just to walk around the grounds and take in more of this amazing hotel. I can’t wait to go back and stay longer, as one night here simply wasn’t enough. Check in – Upon arrival at the hotel, we had an amazing welcome and were met with a gorgeous lobby. Even though it was late at night, we were given a tour of the hotel (which is beautiful by night all lit up) and then checked in when we arrived at our room. Everything was easy, convenient and quick. Room – Our room was fantastic, complete with a very comfortable living area and separate bedroom. Our floor to ceiling windows looked out over the infinity pool, which showcased a gorgeous sunrise with light reflecting off the water in the morning. There was lots of space for our bags and space to spread out, as well as a desk to work at. The design of the room was immaculate. View from our room at sunrise. Bathroom – The bathroom was very large, with a separate shower and tub. Had we spent more than just one hurried night here, I would have envisioned taking long luxurious baths but the shower itself was incredible too so it made up for it for our one night there. 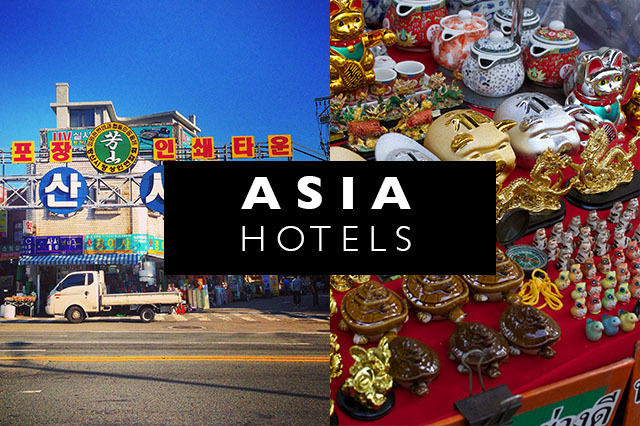 Design – I loved the modern design of this hotel, combined with local India architecture. The domes and arches create a very nice organic mix with the sleek modern aesthetic in the hotel. The neutral color palette mixed with bold colors like oranges and reds popping out provided a very chic and yet very comfortable palette.Dining – We only ate breakfast at the hotel during our one night there and the breakfast buffet had everything and more. We thoroughly enjoyed the gorgeous setting and wonderful food for a leisurely breakfast. The restaurant setting where breakfast is served. Overall Impressions – I loved this hotel and wish we could have stayed longer. 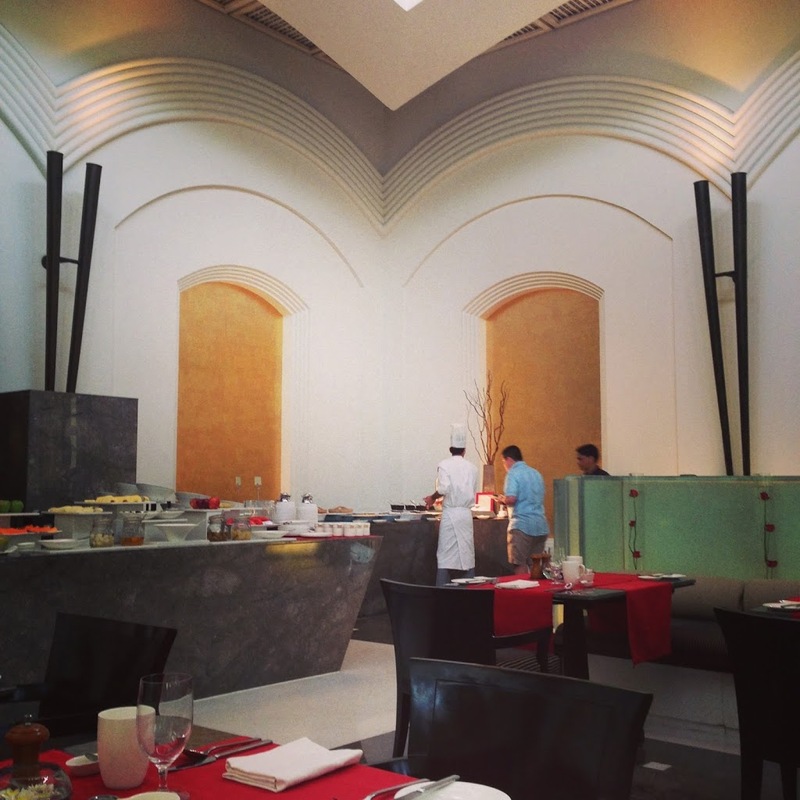 The architecture, the rooms, the service, the food, everything was impeccable. The location was also great, within a quick drive into Delhi and close to the Delhi airport, the hotel for our needs and itinerary was perfect!